I dedicate my whole life to the ocean and all the water sports. That is why life brought me on an island called Lanzarote (European Hawaii). I am passionate teaching and sharing the ... moreenthusiasm so that the students can really get impression what is a life of a real WATERMAN. 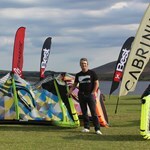 The National Training Centre was established by two highly experienced BKSA senior instructors in 2007 to provide the finest level of kite surfing tuition in the South East of England. The lessons are run from our centre on the beach at Camber Sands, East Sussex, near Rye. 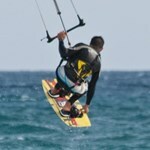 With the experience and enthusiasm of the whole team, The Kitesurf Centre is a fantastic place to learn kitesurfing or any kite or watersport. 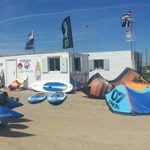 The Kitesurf Centre is rider owned and run. 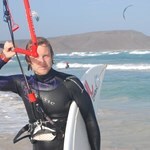 Thomas and Tristan have been kitesurfing since the sport begun. They conduct or oversee all the courses and using their experience, make sure everything runs smoothly so the students enjoy themselves while having a productive lesson. 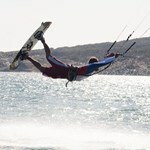 Whilst holidaying in the Dominican Republic back in 2004 I had my 1st experience of Kitesurfing. I knew that I wanted to give this a go as soon as I saw it. During my 1st lesson I ... morehad already made my mind up that I wanted to become an Instructor and get smiles on the students faces as big as mine. 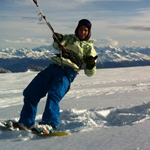 During my 1st year as a Kitesurfer I travelled to Malaysia, Thailand, Vietnam spending many weeks practising and increasing my ability. 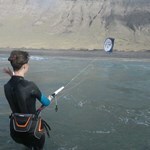 I even got roped in to assisting instructors on my travels. I obtained my BKSA Instructor qualification within the next 12 months and began working part time for other schools locally and in Camber sands and Hunstanton. 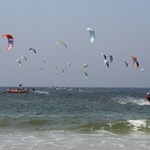 kitesurfing was beggining to take over my life now and an opportunity arose to set up a Kiteschool in Sri Lanka. After returning from there I decided to set up my own UK school based in East Anglia but flexible to teaching locations. I gained the Senior BKSA Instructor qualification and also attended the IKO Instructor course. During the winters I decided to continue to work internationally as the weather is cruel to students here in the UK during these times. Last winter I accepted the offer of the position of School Manager and Head Instructor at a Watersports/Kiteschool in St Lucia.